Walk straight into the heart of the Queensland outback and explore on foot the magical secrets of Carnarvon Gorge. This is Queensland’s answer to the Kimberley. Except that the tracks here are much kinder underfoot, the weather is significantly better for walking and there’s a lot more to see in far less time. With towering cliff faces, endless views, prolific wildlife and unsurpassed indigenous art sites, this is as good a walking destination as you find anywhere in the world. Carnarvon Creek carves a twisted route through the spectacular sandstone gorge. We explore all the best of the Carnarvon Gorge walks including the Carnarvon Great Walk. The clarity of the permanent water is particularly impressive, nurturing stands of cabbage palms and pockets of remnant rainforest. The rare king ferns with five metre fronds among other flora create a prehistoric feel to this landscape. En route, we walk the rainforest-clad Bunya Mountains where bunya pines and hoop pines tower overhead and the forest is cloaked in ferns, mosses and vines. The walks here are totally different to Carnarvon Gorge with rainforest, big trees and views out to the Pacific coast. Another bonus is to stop at Cania Gorge, a little known and very isolated National Park with eucalypt forest, rugged rock formations, lots of bettongs and other amazing wildlife. Every last detail is taken care of so you can fully experience these stunning landscapes stress free. Indulge yourself at Carnarvon Gorge Wilderness lodge and along the way dine at restaurants enjoying a la carte chef-prepared meals (see inclusions). And with two outstanding guides looking after you, you can pace yourself because we offer a choice of walking options along the way. Depart the Airport International Hotel Brisbane at 8.20am and Brisbane airport at 9.00am. Travel via Woodford and Yarraman. We’ll arrive at the Bunya Mountains about mid-afternoon and enjoy a 2-hour circuit walk in the beautiful Bunya Rainforest. A full day of bushwalking along an almost flat track, taking in most of the highlights of the Bunya Mountains including delightful streams, cascading waterfalls, stunning lookouts, dense rainforest and, of course, a lesson about bunya pines. A fair bit of driving today as we head north to Cania Gorge. Most of this countryside is pastoral, with pockets of extensive cropping. Our driving route crosses many huge rivers, mostly dry at this time of year, but it’s easy to imagine just how much rain does fall at certain times. We’ll stop in the rural town of Mundubbera for lunch, then arrive at Cania mid-afternoon. Our first walk at Cania Gorge takes us to a high vantage point where we can explore Giants Chair. A half day of hiking at Cania Gorge, visiting some evocatively named features – Bloodwood Cave, Dragon Cave, The Overhang and Dripping Rock. Then we’re on the road again heading for Carnarvon Gorge, travelling through the outback towns of Monto, Banana and Biloela. Huge coal mining and gas projects are visible. We’ll unpack the bags here for 3 nights in an idyllic park-like setting. This morning’s walk to Boolimba Bluff is one of the best of the Carnarvon Gorge walks. We skirt around the gorge rim for absolutely amazing views out over the gorge and the plains below. Next is an easy stroll along Carnarvon Gorge Creek. This gorge has been a natural ecological shelter for wildlife including pretty-faced wallabies, kangaroos, goannas, echidnas and platypus for millions of years – not to mention the prolific bird life. The steep overhanging walls of Carnarvon Gorge house some of the most vivid aboriginal artwork anywhere in the country, with animals, humans, weapons and tools all clearly depicted in rich ochre patterns. 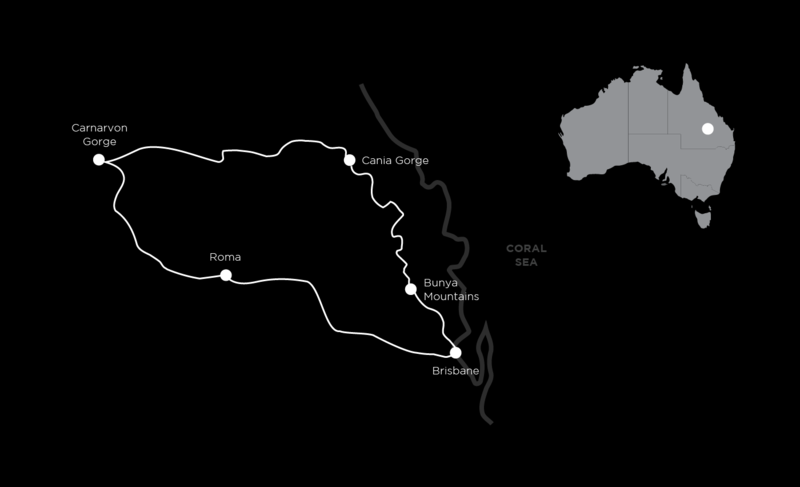 After lunch, we will explore two fascinating gorges – Mickey Creek and Warrumbah Gorge. Climb into the Amphitheatre like gorge and follow Warrumbah Gorge till it narrows to just a metre wide. There will be an opportunity for agile walkers to explore the upper reaches of these gorges. We start the day early with an opportunity of walking right to the end of the Gorge to Big Bend on the Carnarvon Great walk – a distance of 20 km return. There are many side-walks to do on the way back, such as Boowinda Gorge, Ward’s Canyon, Amphitheatre & Moss Garden. There are indigenous art sites and rock engravings at places like the Art Gallery and Cathedral Cave where you’ll see literally thousands of such images, all there to teach aboriginal customs, laws, history and where to find food. You’ll walk the length of the gorge, crisscrossing the river on stepping-stones many times. If this sounds like a lot, there are numerous fascinating gorges to visit with our second guide who will be offering a less demanding walk for some of the group. This morning we will have time to explore the Rock Pool and Baloon Cave, before we’re on the road again for the country town of Roma. There is an opportunity today for a helicopter flight (at your own cost). A travelling day, heading back to Brisbane through the rural Darling Downs towns of Miles, Dalby and Toowoomba. As well as a food bowl area for Queensland, Darling Downs is also a huge cotton production area. Estimated arrival in Brisbane around 4.30pm. The tracks including on the Carnarvan Gorge walks are well graded and mostly easy to negotiate. The full day walks average about 16km. There are opportunities for fit walkers to challenge themselves on four of the days with rather lengthy walks of up to 22km. In Bunya, you’ll spend two nights in large Chalets with ensuite rooms. At Cania we stay in cabins. For the next 3 nights, we stay at Carnarvon Wilderness Lodge in luxury glamping tents right in the heart of the park. The last night is spent in Roma in a very comfortable motel. All the rooms have ensuites. Every night the two course dinners will be prepared by professional chefs. The meals at Carnarvan are special affairs and include three-course dinners with an emphasis on local produce. At Bunya, we get to try Bunya nuts which are an indigenous delicacy. The packed lunches and picnics complete the circle ensuring that your appetite is always satisfied. You can look forward to having lunch at some of the most incredible locations that this country has to offer. A walkers lunch may include a high protein type salad, a roll or a wrap, a muesli bar, cake or muffin and a piece of fruit. Each day is slightly different. Lunch is always augmented by Auswalk’s famous trail mix. You also get to enjoy a lovely sit down a la carte lunch at Carnarvan as a way of saying farewell to this amazing region. Importantly, you start each day with a chef-prepared cooked breakfast which is a great way to ready yourself for the upcoming walk. Most of the tracks are firm and well cared for including on the Carnarvon Gorge walks. There will be a small amount of rock hopping over Carnarvon Creek but the rocks are substantial making this process easy. There’s one small climb but an alternative for that walk is available. Full day walks can be as long as 22 km, thus there are great opportunities for fit walkers to challenge themselves. This trip operates with two professional guides knowledgeable of the region and local wildlife. They ensure that you have both a safe and enjoyable walking holiday and can offer easier and harder walk options along the way. Pre and post tour accommodation: There are many good hotels in Brisbane, however we pick up and drop off from one hotel the Airport International Hotel Brisbane, 528 Kingsford Smith Drive. The tour starts at 8:20am at the Airport International Hotel Brisbane or 9.00am from the airport. The estimated arrival time in Brisbane is around 4.30pm on the last day. We only depart at the best time so the weather will be perfect for walking. See the Bureau of Meteorology for information about temperatures and rainfall ahead of time to ensure proper clothing. If you have any questions about the Carnarvon Great walk or any of the other walks on this trip, feel free to ask one of our destination consultants or to speak with one of our guides. You can get in touch with us via our contact form, email us at info@auswalk.com.au, or call us on +61 3 9597 9767.